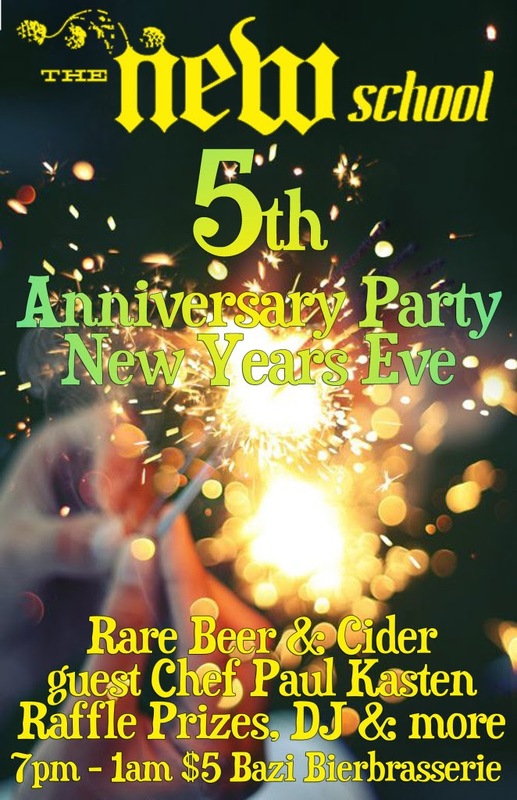 One of my favorite local beer websites the New School is celebrating their 5th Anniversary on New Years Eve and will be thowing a party at Bazi Bierbrasserie. This looks to be an epic party with great food from Chef Paul Kasten and some impressive beer & ciders to be tapped. See details below. Portland based beer and cider webmag The New School celebrates their milestone 5th anniversary this New Years Eve with a party at Bazi Bierbrasserie featuring 10 rare beers and ciders, raffle prizes and food from acclaimed beer Chef Paul Kasten (formerly of Wildwood). In typical annual fashion this years party will be a charity benefit, this year all proceeds will go to Guide Dogs for the Blind. Tickets are on sale via Paypal for only $5 and include a buffet style dish from Chef Paul Kasten: Pork Collar braised in wort and sliced into portions, served over roasted winter veggies simmered in the pork braising liquid, and fried sage.